Los Angeles's Natural History Museum on May 6. Similar to an earlier playback session of Neil Young's New Album 'Earth' at L.A.'s Natural History Museum , another playback session is scheduled for tonight. On Friday, May 27th at The Museum of Modern Art in New York City, WFUV will present the playback of Neil Young + The Promise Of The Real's upcoming release, EARTH, in its entirety in Pono high definition fidelity audio. Young will introduce the evening with his insights and explanation of the making of EARTH via an interview with WFUV's Carmel Holt. This event will take place in the Abbey Aldrich Rockefeller Sculpture garden during "UNIQLO Free Friday Nights". Admission is free from 4:00 - 8:00p.m. The line for UNIQLO Friday Night tickets begins at the Museum's 54th Street entrance (between 5th and 6th Avenues). Your UNIQLO Friday Night ticket permits entryto all Museum galleries and exhibitions as well as this special event, space permitting. NOTE: Tickets are issued on a first come, first-served basis. The Sculpture Garden will close when it reached maximum capacity. This is a listening playback experience and not a live performance. EARTH features performances of songs from a range of Young's albums, including last year's The Monsanto Years, 1990's Ragged Glory, and 1970's After the Gold Rush. The audio was captured during Young's 2015 tour with The Promise of the Real, fronted by Lukas Nelson (vocals/guitar) and Micah Nelson (guitar, vocals) - Willie Nelson's sons. The tour included Young performing solo and with the band for a full electric show. More on Neil Young's New Album 'Earth' at L.A.'s Natural History Museum . 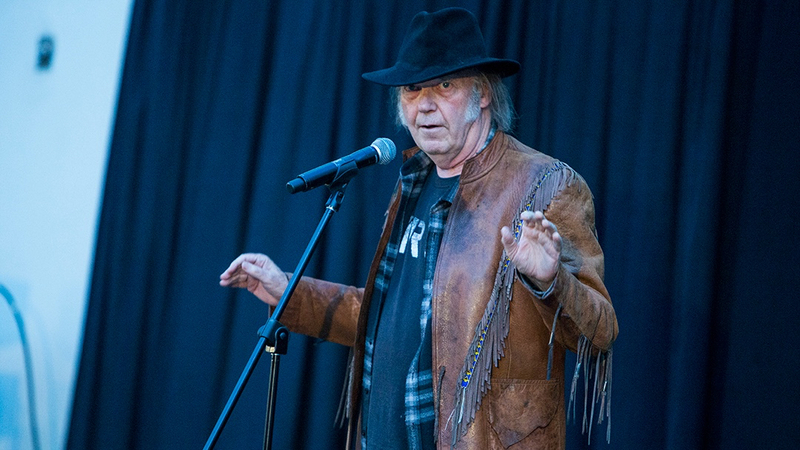 I love Neil Young buy why is he playing an upcoming rock concert album in an art gallery anyway? So weird. First off, thank you Thrasher. At 50+, my Neil fandom is kind of spiraling out of control. Caught the POTR show at Jones Beach, was dancing in the mud and rain in NOLA, and have plans for Marseille in a few weeks. But without you, I would have had no clue about the MOMA event, literally a half block from my office. Had to audible my evening plans and before I knew it I'm in the garden courtyard. Was concerned it might be a bit of a crowd, but no need. By far the vast majority were tourists just milling about with maybe a gaggle of Neil Young fans. Of course we quickly found each other, and I guess you know how that goes. Was hanging with a couple of guys sporting some swell Earth attire. At one point I made mention of Marseille and a young man from France showed me his Marseille t-shirt and shared his plans to attend the show with his dad. He was a full on fan. Neil came out with the radio host, said a few words and he was off. The album played, and the gaggle of Neil Young fans did what you would expect us to do in an awesome setting with live Neil cranking. With the tourists streaming by, kind of felt that we were collectively part of some performance art, "Aging American Rockers". Neil could be seen way up high in a window, identifiable by the silhouette of his black hat. Couldn't help note that the extended version of LAOL harkened me back to the rain soaked Jazz Fest marathon version. But then during the extended ending of LAOL, one of my new friends observes that Neil is standing across the atrium. By now the gaggle had diminished, essentially we were comparable in number to his entourage. I was able to walk up to him, shake his hand, say a few words, chat with his manager for a bit, and then stand back for some time as if our gaggle had become part of his gaggle. This lasted for a few minutes, and then Neil departed. All that was left was some high fives and excited banter among my Earth wearing friends and then I was on my way. Just awesome! This really was just supposed to be a normal day. Thanks again Thrasher for making it anything but normal. Neil's introductory remarks here and a bit of playback. Neil Young's childhood home is up for sale.